Freed from the constraints of a grid, the symbols of a stitch map snuggle together like the stitches of knitted fabric. You get to see the stitches of each row, and how they connect to the stitches of the rows above and below. Familiar stitch patterns take on new clarity when viewed as stitch maps. Our ever-growing collection of stitch patterns contains old favorites and new concoctions. 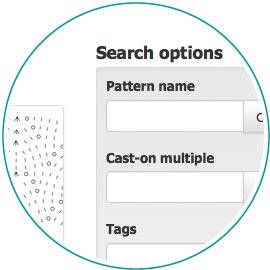 You can search by pattern name or cast-on multiple, select by tags, or simply leaf through at your leisure. You have choices when viewing a stitch map. By default, its symbols are on display, but you can also view row guides that highlight rows, and column guides that trace stitch columns. And for repeated patterns, you get to decide how many repeats are on display. 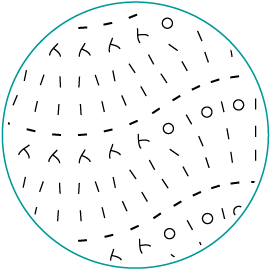 Want to view a particular stitch pattern as a stitch map? If it’s not already in our collection, you can add it yourself. 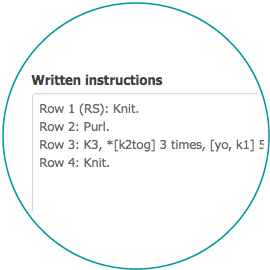 Enter the written instructions for the stitch pattern, and we’ll draw the stitch map for you. Free registration is all that’s required. Membership has its benefits! 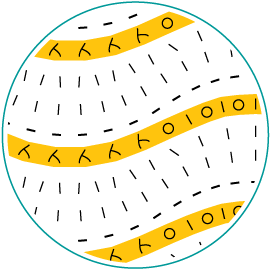 Subscribers can view stitch maps with their current row highlighted, export stitch maps as publication-quality images, control the visibility of the patterns they add to the collection, and more.